It's been a long time since I last read this, and you make me want to seek it out again. I agree with your reflection here: "Why bother with texts that need to be watered down when we have many available that cater to the very needs of the children?" I love the idea of finding works that are suitable and speak to the person where they are now or are just a bit ahead of them so as to challenge understanding. The idea of providing snippets of books or altered works instead of actual books feels odd to me. There are so many books appropriate for each age, I'd think picking from among those would provide plenty of options. I am a fan of abridged novels, or illustrated classics which I grew up on. They were great to give me an introduction to books I might have struggled with. Later on if the abridged classic made an impression (like all those Dickens and Eliot, for example), I sought out and read the complete versions. I think there is a place for these books. However I do not understand abridged versions of White Fang, which I don't think really needs it. Thanks for such a thorough review! I've had this book on my shelf for years and I think it's time now for me to finally get on with reading it. It has been a very long time since I read this book. I like the Evolutionary Biology angle to your commentary. Lately some folks have been advocating for incorporating this into literary analysis . I agree with this approach. You correctly point out the racism and sexism that is common, with some exceptions in these older works. 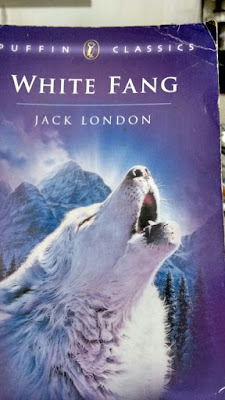 I've never read White Fang, I'm ashamed to report! I am really interested though in the co-evolution of humans and dogs -- they've apparently evolved in particular ways that make them sensitive to our facial expressions and emotions, which is fascinating! "Invented themselves" is an excellent way to describe it. Divers and Sundry, a bit ahead sounds good. If you need to significantly alter the writing for the child to understand, I think you should just choose a different text. LacoScrib, Nishita - I am pleasantly surprised that you did. I never used to be fully involved in any illustrated classics I read, but maybe I chose the wrong ones. I did read Oliver Twist, and when I found out it wasn't the full version I almost felt a little cheated... I'm sure it's a matter of preference of course. But I do believe the emphasis on reading "classics" takes away from the pleasure of well-written children's books. It's a pity then that the classics concerned aren't even in their original form. I read White Fang and Call of the Wild when I was in 5th grade. I remember both of them, but after reading this post I think I should reread them as an adult. I know I will have a different perspective and your thoughts really intrigued me. I didn't realize the history of dogs. Very interesting!